Which devices will support 5G? Will my iPhone X support it? That's a trick question right? Had the 5G spec actually been finalised yet? And they're teaming up with Intel are they not? They keep announcing their 5G modem but suffice to say despite the millions spend on advertising it, announcing it and so on they do not appear to have an actual lump of silicon we could legitimately call a 5G modem. They certainly haven't demonstrated anything and so Qualcomm are in the lead here with Intel just appearing to lie endlessly to reassure both the investors and their.... customer (Apple) who will expecting large quantities of chips (I wonder if Intel will be planning on doing them on their equally mythical 7nm process? Or maybe the struggling 10nm one instead?) on time and fully functional. I personally expect 5G in mobile phones to mostly be very limited but I'm seriously hoping to be proven wrong. As said... no Intel working silicon whilst Qualcomm and in fact Samsung have demo'd silicon working. Apple have seen shares slide again this week down from their highs of October as yet another supplier says weak demand next year. I imagine that Apple will be one of the last if not the last to have a 5G smartphone this rollout because they are so cautious these days and reactive rather than proactive it's unbelievable. Why would that be a trick question? True. Half the time on my commute I don't even get a signal at all let alone 4G! I also can only get one provider reliably at home so would love some more competition. I currently just get to switch between the various EE based networks but its not ideal. I only live just over 3 miles from Southampton! Intel sounds like it will be a bit late for launch but a variety of mobile devices and routers will be ready for the launch by the sounds of things. That is far from clear, regarding my specific question. Does that mean that new devices will be ready to launch or that software/firmware updates will be issued to pre-existing devices to provide 5G connectivity? Please quote me the part from the article that says "no devices support 5G yet". 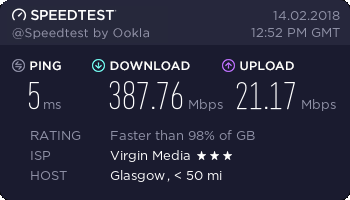 Connection speeds up to 10gbps. Although throughput increasing from current dial-up to dual ISDN speeds - restricted largely through to over contention and poor peering.